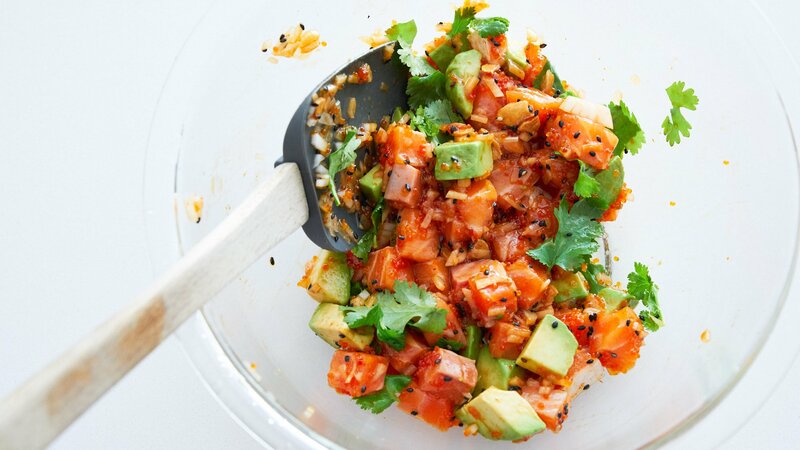 This easy Spicy Salmon Poke is a festival of textures and tastes in every bite. With big cubes of salmon marinated in a fiery sriracha and sesame sauce, the fish is brought to life by crisp, sweet onions, crunchy tobiko, creamy avocado, and fresh cilantro. Poke (pronounced Poké as in Pokémon) is a classic Hawaiian dish made by marinating raw fish and mixing it with a variety of textural and aromatic components. Like the Hawaiian Islands themselves, Poke is a seamless melding of foods from around the world, inspired by dishes such as Japanese zuké-maguro, Korean hoe-deopbap, and French tartare. While I’ve done a traditional Ahi Poke in the past (which is pretty amazing by the way), the best part about Poke is that it’s an open platform that can be made in about as many ways as there are people who make it. This time around, I started with a base of salmon and avocado marinated with sesame oil, sriracha, and soy sauce. Then, some earthy black sesame seeds, salty tobiko, and crisp, sweet onions add layers of contrasting textures and tastes that keep each bite interesting. Finally, my Poke is finished off with crunchy fried garlic, savory nori, and the fresh zing of cilantro. 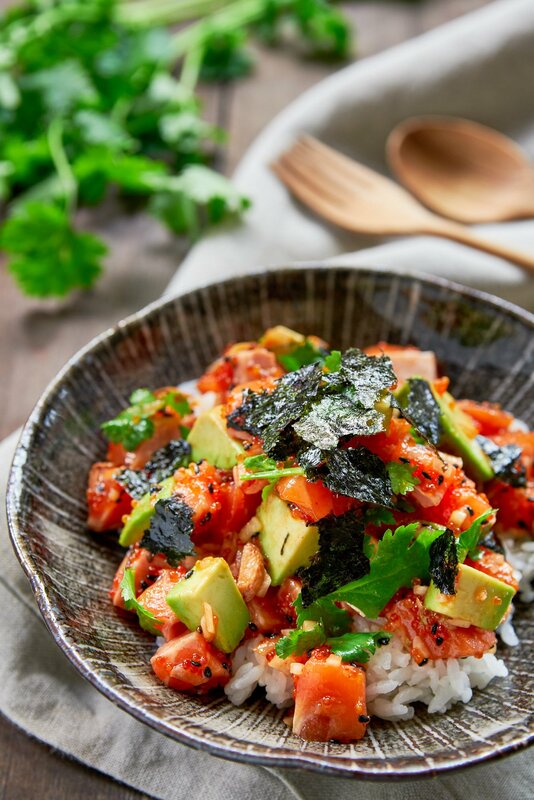 Served over hot rice, this spicy salmon Poke makes for a blissful bowlful of heaven that’s sure to put a smile on your face. 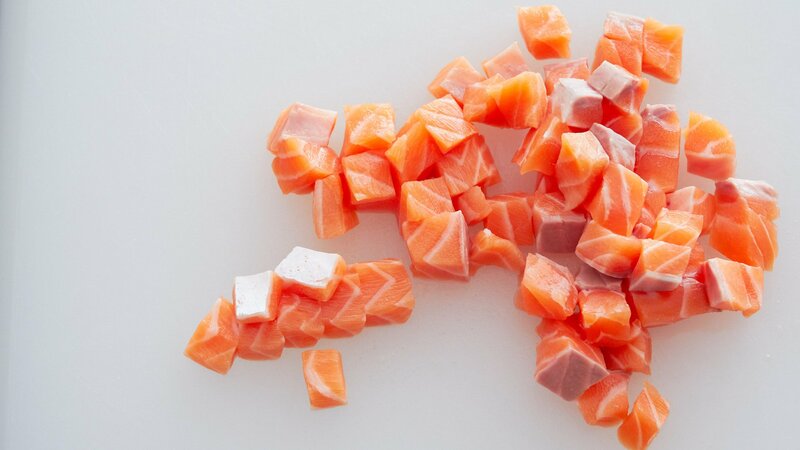 When making Poke, the first thing you need to do is to make sure your fish is safe to eat raw. Beyond finding a fish monger you trust to give you sound recommendations, do some research on how to reduce the risks of eating fish raw. It’s not as cut and dry as looking for labels such as “sushi-quality” or “sashimi-grade” (which are meaningless marketing catchphrases). To season the Poke, I used Alaea salt, which is a coarse reddish orange sea salt from Hawaii. If you can’t find it near you, you can substitute other coarse salts such as Maldon or Fleur de Sel. If you don’t have a coarse salt, be sure to reduce the amount you add, or your Poke will end up too salty. This Poke is delicious freshly made, but letting it marinade for a few hours in the fridge allows for all the flavors to meld while giving the salmon a firmer texture. Because the fish is raw, be sure to enjoy it the same day you make it. 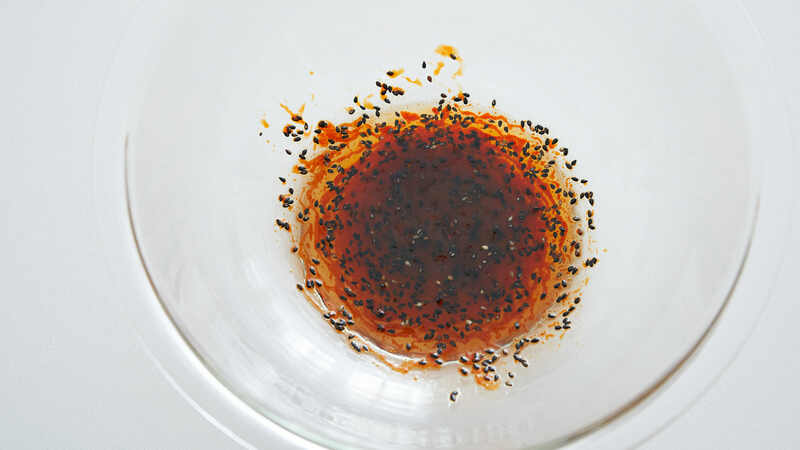 Whisk the sesame oil, sriracha and soy sauce and sesame seeds together in a bowl. 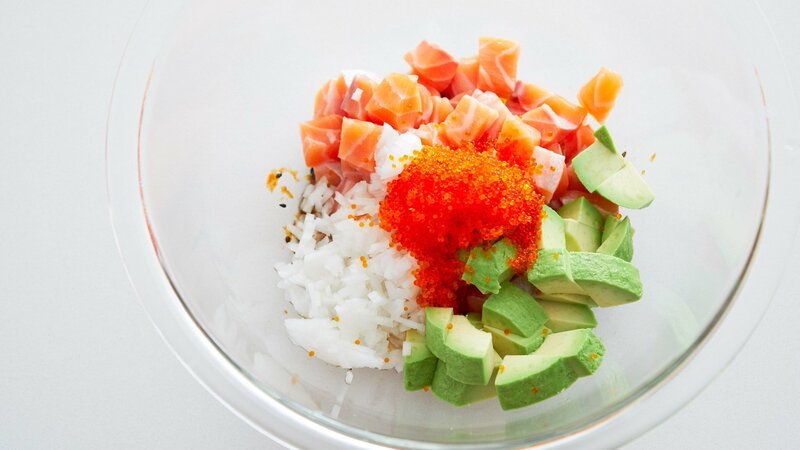 Add the salmon, onions, avocado, and tobiko to the bowl and stir to combine. Season with Alaea salt and fried garlic chips to taste. 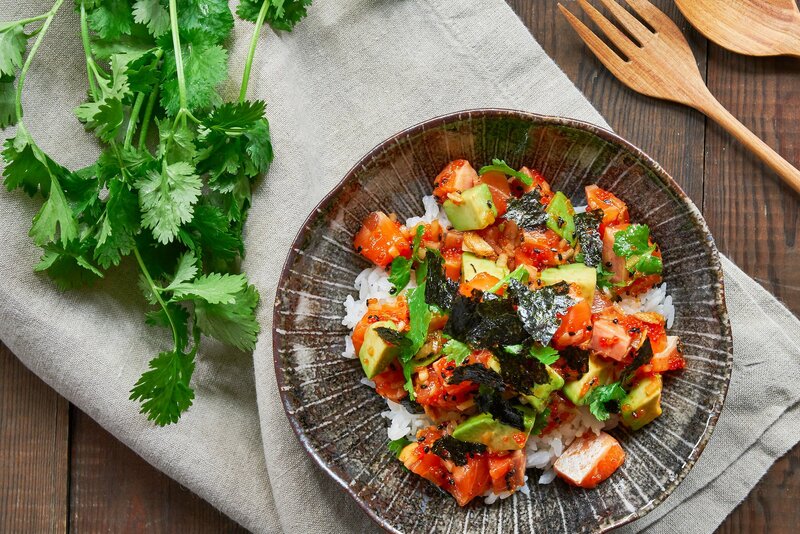 Garnish with cilantro and nori and serve your Spicy Salmon Poke over hot rice.